As I read Kristin Harmel’s interesting take on the roundup of Jews from their Paris homes during the Holocaust, I began to feel that it was my duty as the granddaughter of a Nurnberg immigrant who grew up under the Third Reich to continue to immerse myself in the history of the times. 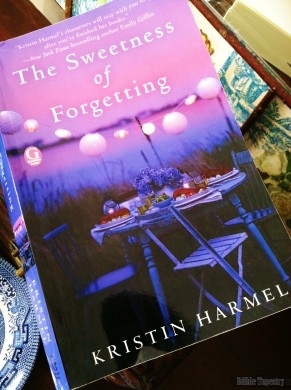 Inspired by the events that took place in 1940s Paris, in Harmel’s touching and informative novel The Sweetness of Forgetting, I began watching hours of documentaries on the war and Hitler’s unbelievable success in wooing entire populations to do his evil bidding. It has always been mind-boggling to me that so many decided whole races of people should be snatched from their homes and used as slaves until they were finally exterminated, simply because one lunatic said it should be so. As I learned from historical accounts and Kristin’s book, I was so caught up with hope for the survival of any of the poor souls who were hauled off by train to work camps, or straight to the gas chamber, that as the 70th anniversary of the liberation of the Auschwitz prisoners approached, I decided I would finally sit down and watch the movie Schindler’s List. I’d been avoiding it for decades because I just didn’t want to sit through hours of seeing such horror portrayed. But I realized it was so worth it when the end credits rolled by and real-life survivors streamed into the picture to place memorial stones on Oskar Schindler’s grave. I’m so grateful for the nudge I received from Harmel’s tender tale which, in so many ways, is ultimately about true love, and led me to learn the heroic deeds of a man such as Schindler. In The Sweetness of Forgetting, main character, Hope, learns during moments of clarity for her dementia-suffering grandmother, Rose, snippets of the elderly woman’s former life as a girl growing up in Paris, before the Nazi muster of Jewish residents. It’s this information that sends Hope, albeit reluctantly, on a quest to the French city to investigate whether or not supposed members of her family ever existed. It’s not the best time for Hope to abandon her family’s bakery, handed down from the same French grandmother, the one she calls Mamie, as the Cape Cod establishment is in danger of closing. Her grandmother Rose’s special crescent moon cookies and star pies, that seem to be tied to the Alzheimer’s sufferer’s obsession with star gazing, are favorites of the generations of patrons who frequent the shop, but Hope isn’t convinced that she can bake and sell enough to keep the institution in her coastal town running. Kristin Harmel included so many of “Mamie’s” recipes in her book that I was undecided as to which, if any, I should make to go with my review of the novel. 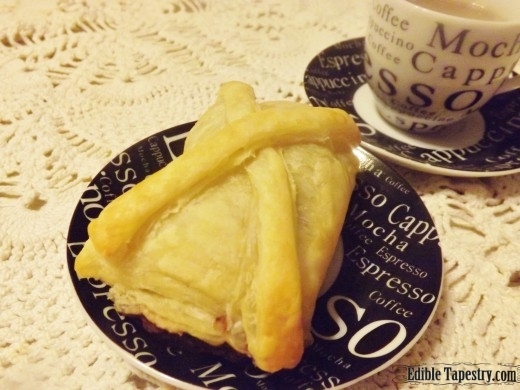 Because I held my breath waiting to see if Harmel would include Mamie’s recipe for the pain au chocolat that Hope serves at the bakery, I was a little disappointed when I reached the last page and it wasn’t included among the others in the collection. 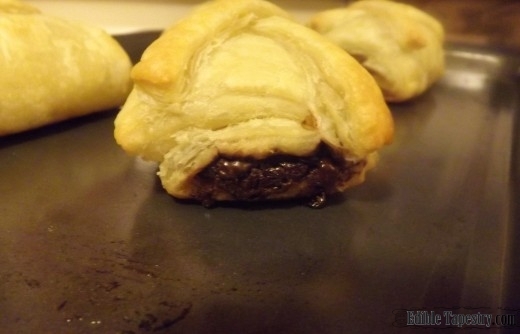 I decided then and there that I’d make a quick and easy version, using rich, dark Bavarian chocolate to make user-friendly chocolate croissants for those who wish to make and take them as refreshments to book club meetings to discuss The Sweetness of Forgetting. 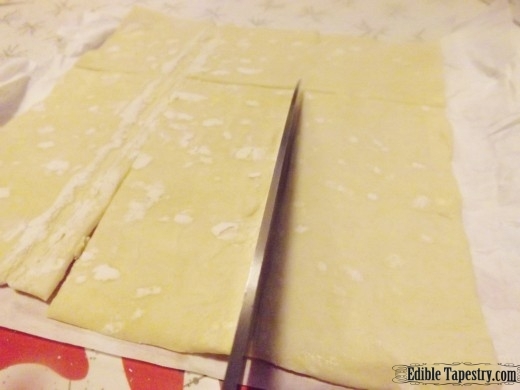 For anyone who wants to put in a few days of work, and lots and lots of rolling of stiff dough to make the pastries from scratch, as I’m sure Mamie did, they can find a great recipe and tutorial here. I’d love to be able to give every Auschwitz survivor a little piece of heaven for the hell they endured under the Nazi regime. 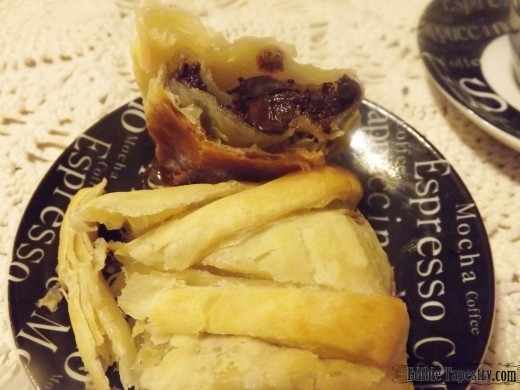 All I can offer, however, is a method to make these sweet morsels with love and the chocolate of my own grandmother’s homeland, little pieces of heaven, for sure, made from frozen puff pastry and squares of 70% cacao Bavarian shokolade, but certainly not enough to make up for the atrocities visited upon so many innocent lives. 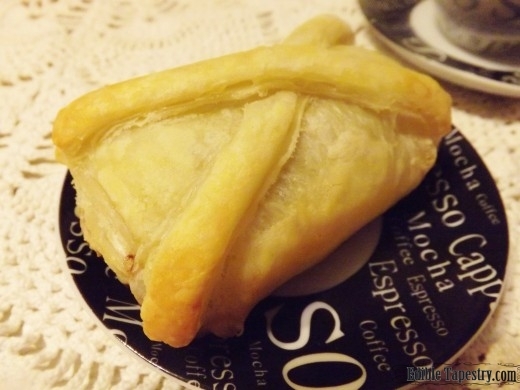 The simple ingredients for this “recipe” are thawed Pepperidge Farm frozen puff pastry sheets and a few bars of really great German chocolate. I used Moser Roth, made in Germany, from Aldi supermarket. 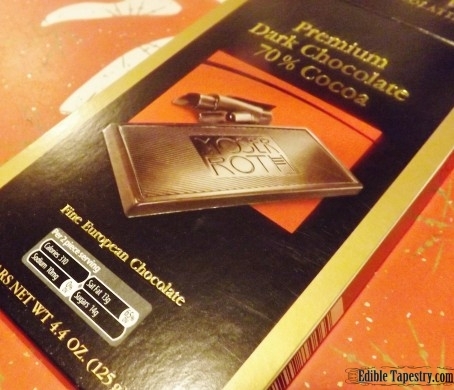 It comes in packages of 5 individually wrapped bars in a 4.4 oz. box for a surprisingly low price. To make the pain au chocolat, I preheated my oven to 400F. 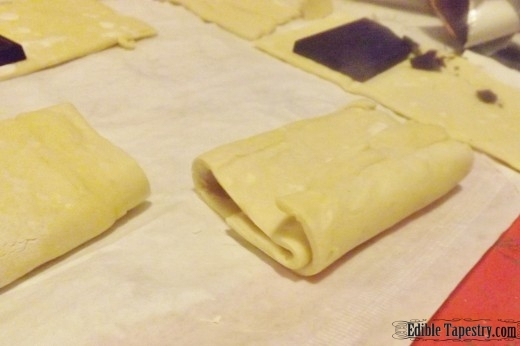 Then I cut each sheet of pastry, two come in a single package, into four rectangles. One across one end, and three from the remaining. 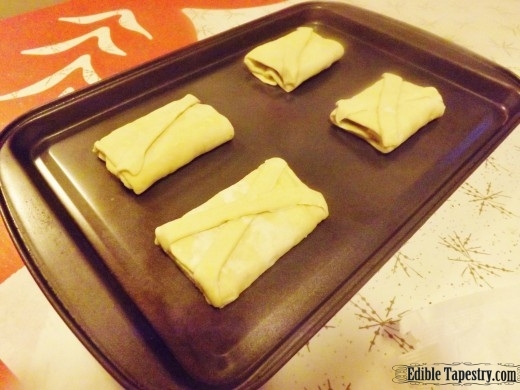 You could make these rectangles smaller if you wanted to make mini pastries. 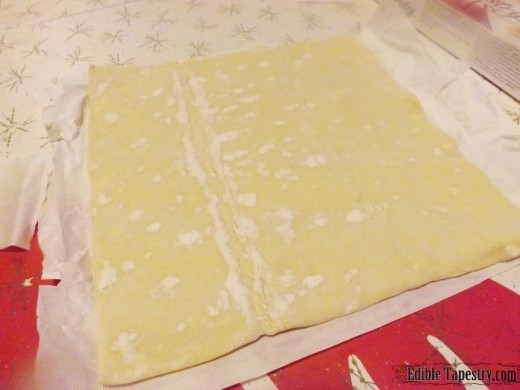 My method left one square of dough in a corner that I cut into strips to use as decoration. 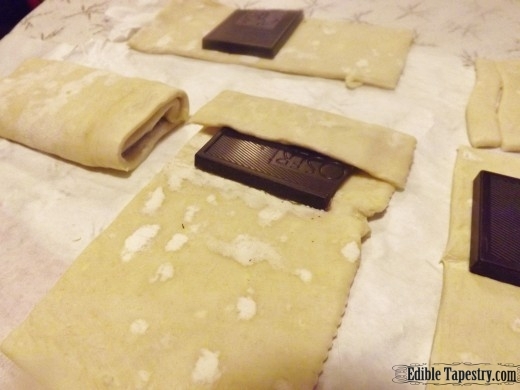 Next, I cut bricks of the chocolate slightly shorter than the width of my rectangles of dough. I placed one near the end of each rectangle. Then I just rolled them up. 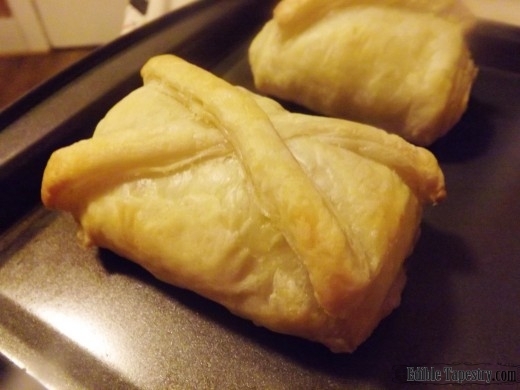 I didn’t have to use water or egg to “glue” the pastry shut or even seal the ends. I just placed them on a sheet pan and decorated the tops with the extra dough. 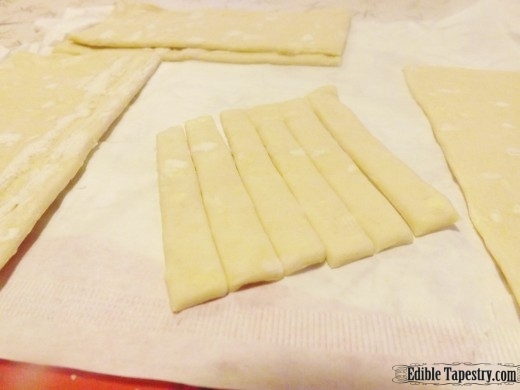 Roses for “Rose’s Pain au Chocolat” would be fun, especially if smaller pastries are made, but I just criss-crossed dough strips over each. I baked them for 15 minutes.